The DE2011-DL is an ultra-compact high performance 2D imager engine. It features an exceptional high-speed sensor which enables image capture at a full 60 frames per second, delivering outstanding motion tolerance. The steady white illumination is pleasant to the user’s eyes. The DE2011-DL OEM engine features outstanding Depth of Field (DOF) reading, a nominal field of view, high motion tolerance, snappy reading and excellent performance on decoding poorly printed bar codes or bar codes displayed on mobile devices and computer screens. 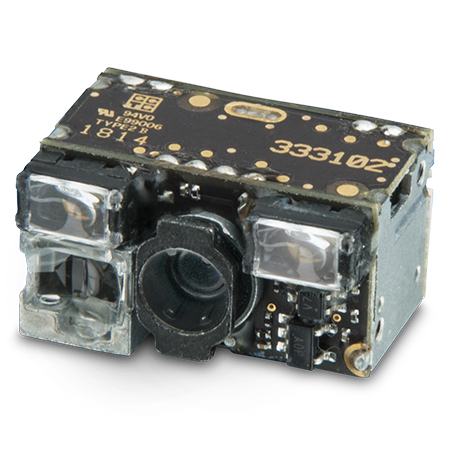 Customers can directly connect the scan engine into their device main board by using the industry standard camera port on a 21-pin ZIF connector. With the use of the Datalogic Software Decoder for Engines (DSDE), customers can integrate the DE2011-DL OEM engine into their device working with the power of Datalogic decoding algorithms. The DSDE is available for Windows, WinCE, Linux and Android operating systems. Customers have full control of the operation and function of the scan engine working within their application.